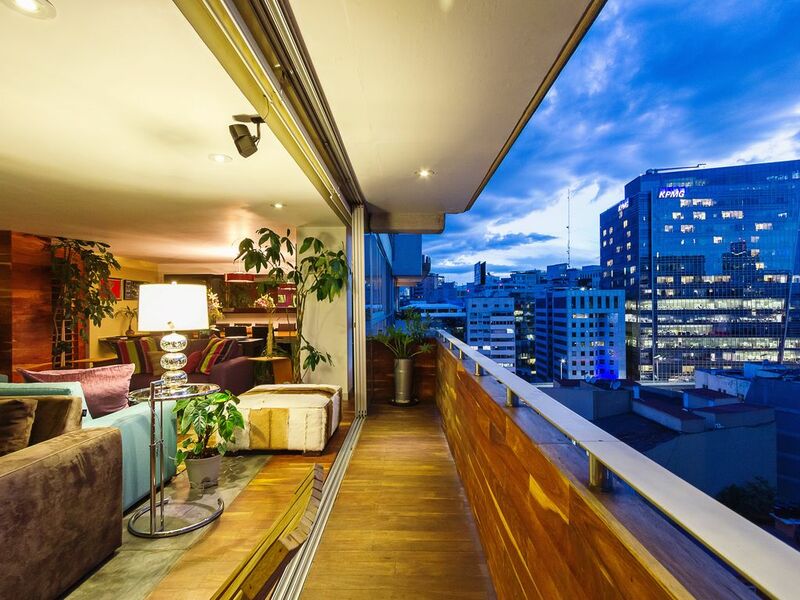 Polanco luxe with incredible views, afforable too! Amazing 11th floor apartment with WOW views of the city in three directions plus all the amenities for a first-class stay. Maid's quarters are included in the home along with a private children's playground on the ground level of the building. A sophisticated, 11th-floor urban retreat, Morales 11 hosts executives and their families (plus help) during long-term stays in upscale, bustling Polanco—where shopping, museums, commerce lie outside secure building’s gated street. Entertaining is easy from swank space with breathtaking city views plus patio, bar, and projection TV. Rich jewel tones and lux wood finishes set a contemporary tone in this urban retreat, where your family will enjoy safety and serenity plus views from windows that fill all rooms with natural light. After a busy day in vibrant Polanco, return to your secure building on a gated street and relax in the comfortable living room by watching a movie on the projection screen. Tie up any unfinished business in the study—its flat screen TV is hung on a wall that pivots, moving the TV into the master bedroom! In the mood to entertain special guests? A glitzy full bar, wine refrigerator, and patio with glorious cityscape views make Morales 11 ideal. Enjoy convenience of fiber optic internet, separate staff quarters (bunk bed + bath), in home with 24/7 security, 2 parking spaces and private playground. Polanco is a center of upscale, modern commerce. Your home at Morales 11 is near Plaza Carso, home to world-class museums and international business headquarters. You’ll be surrounded by high-end boutiques, trendy eateries, and a thriving nightlife scene. 7.- This home is currently for sale and there is a chance that a real estate agent will want to show the house to prospective buyers during your stay. We will provide at least 24 hours notice and ask that the house be tidy during the showing. The unit was spacious but a bit run down and outdated. We were surprised that basic items were not there that you would expect to be provided. It took a day or two for us to get settled and we had to provide for ourselves (paper towels, napkins, liquid dish soap, sponge ect. fortunately a grocery store close by so not a big deal getting supplies. Toilets and drains are slow so be patient. Location was very good and the concierge was very responsive. A nice home in a nice area. How will I receive my deposit? The place was awesome, made us feel at home! It was close to supermarket and other other stores. Rene Arjonilla from Remixto was absolutely Awesome, always willingly to help in anything we needed, we will definitely be back. Condo is close to everything- supermarket- shops- restaurants and you can walk to many things. UBER is easy to get from location- spotless- large and has everything you need- didnt give 5 stars because was emailed that “concierge” would meet us and show us how everything worked and give us the “code” to gain access. Flight and contact info given and flight “on time” but NO ONE met us. We had to convince “door person” through our Spanish, which is not very good, that we were entitled to the ONE key for access. Would have been nice to have had 2 keys since there were 3 adults OR a combination lock. Excellent space with all the amenities you need to feel at home. Our family really enjoyed the projection big screen TV in the evenings for móviles. Great apartment. Loved the space and the location.